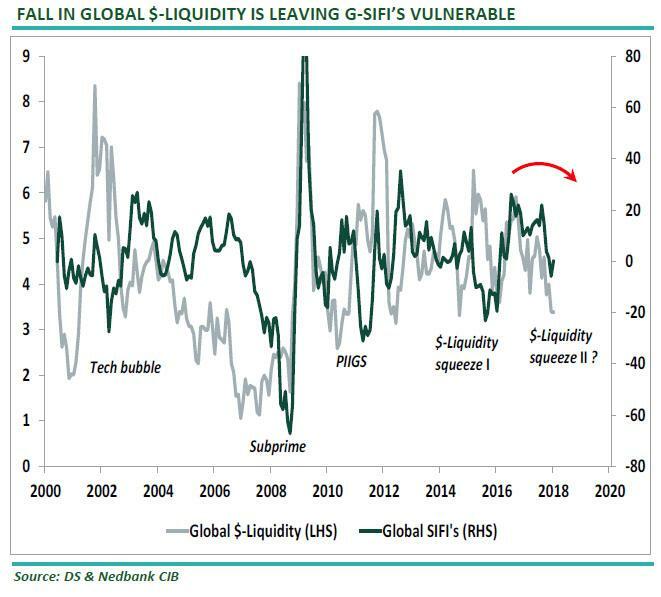 ... Nedbank analysts Neels Heyneke and Mehul Dahya picked up on this topic, and in the latest note write that with the market-weighted cap index of the FSB’s G-SIFI’s starkly decoupling from the S&P 500 and the Nasdaq since the beginning of 2018, and nearly entering a bear market, or down 18%, they warn that "this decoupling will be sustainable. Either the rest of the equities must come under pressure or the financial sector must rally." Reverting back to their favorite theme of dollar liquidity, or the lack thereof, as the catalyst for virtually all of the world's risk asset woes, Heyneke and Dahya show that whereas the S&P500 has so far ignored the slide in the dollar liquidity, the megabanks have not been so lucky, and that the higher the dollar spike, the greater the threat to the G-SIFIs, until eventually the drop is so substantial, the rest of the market will have no choice but to follow lower. 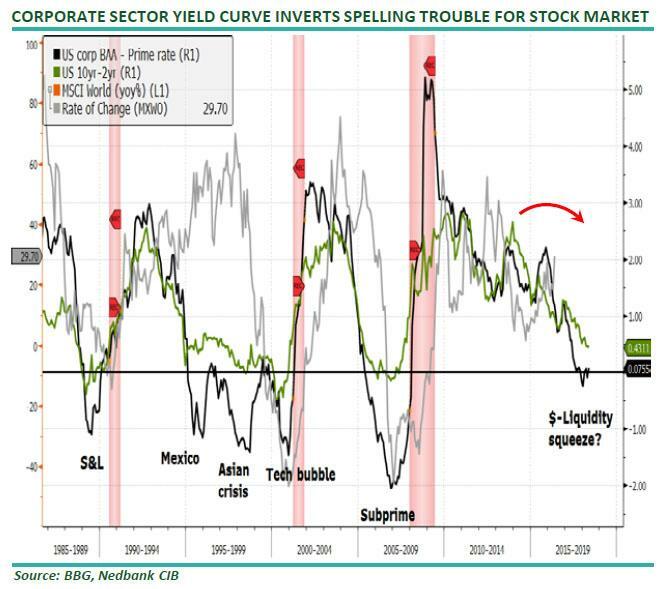 And while we noted much of this last week, a more interesting observation by the Nedbank analysts is that the corporate sector curve (Baa-rated Corporates less the Prime rate) has now inverted. The implication of this is just as profound as a sovereign yield curve inversion as it means that "the cost of capital for corporates is now higher than the return on capital." 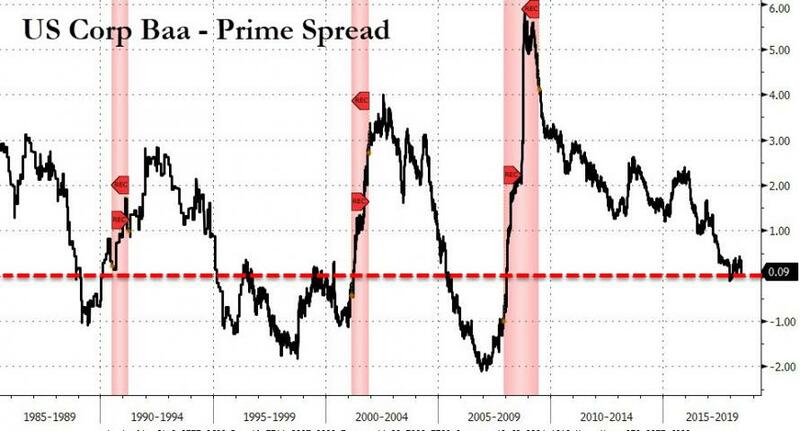 Incidentally, as the chart below shows, every trough in this curve has always corresponded to some market crisis, whether the Asian Crisis, the Tech bubble, the Great Financial Crisis, or the $-liquidity squeeze we are experiencing now. 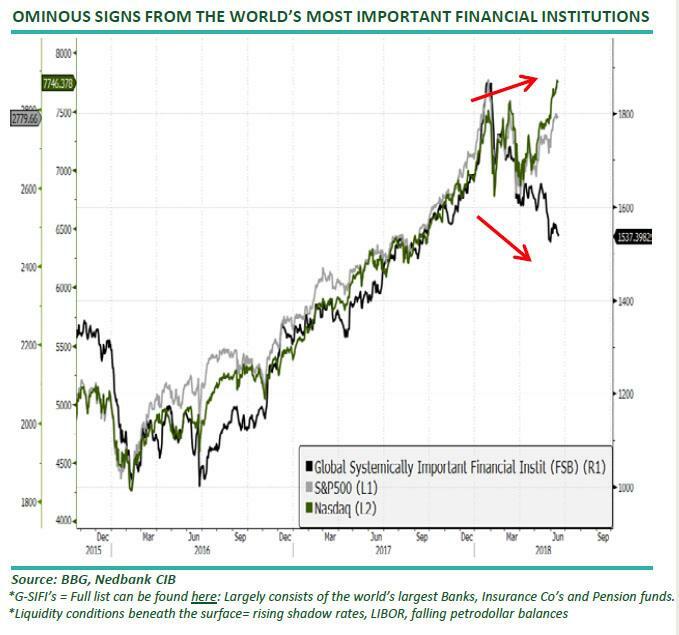 Their conclusion: "Corporates are highly geared and we are concerned the next phase of a contraction in global $-Liquidity and rising real rate (term premium) will infiltrate the stock markets." 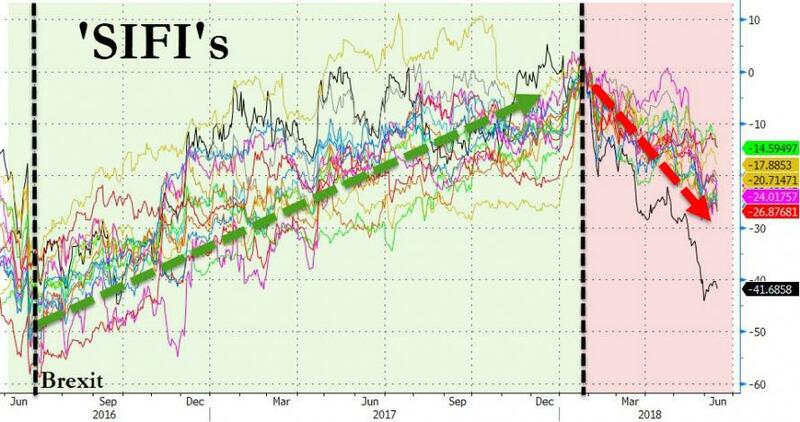 Well, the dollar just hit a fresh 2018 high, and stocks are tumbling, so once again the shape of the yield curve may very well be all we needed to know what happens next.